Ingredients: Tilapia or Haddock, 4 fillets. Red onion, 1 medium sliced. Bell peppers, 2 different colours, sliced. Cherry tomatoes. Lime juice, salt, pepper, oilMethod: The above mentioned fishes are very tender and do not need much cooking time. Defrost and pat them dry with paper towel. Pour oil in a frying pan and when hot, fry both sides of fillets briefly (until they turn whitish). Spray an oven-safe dish with cooking oil and arrange the frilled fillets in it. 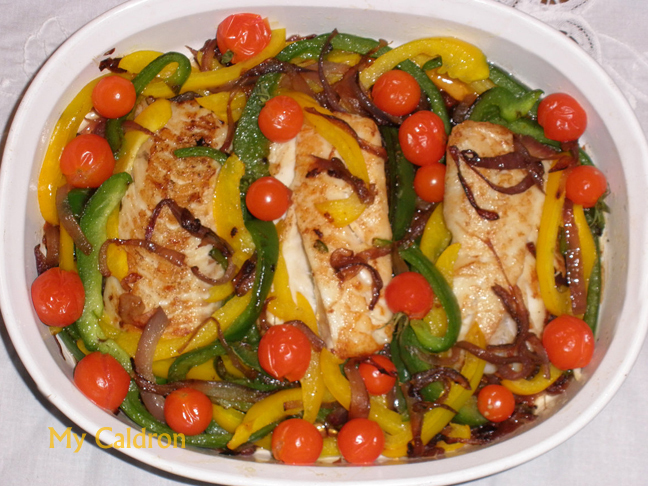 Sauté onions and peppers and top the fish with onions, peppers and cherry tomatoes. Sprinkle salt, pepper and lime juice. Bake in preheat oven (300 degrees F.) for 15 minutes. I usually prepare this dish with a spicy hot salad I am told is Russian, as the two go very well together taste wise. “Russian salad” is made of boiled and cube cut potatoes, small amount of onions and pickled cucumbers all cut in small cubes, lots of dried hot red peppers, salt and lime juice to taste (see picture below). سلام خانم شمسی‌، اگر به نظرات زیر همان پست نان بر بری نگاه کنید، در جواب به یکی‌ از دوستان دیگر، مقدار زیادی توضیحات اضافه بر دستور عمل اولیه داده ام. شاید مرور آنها برای شما هم پاسخ گو باشه. البته کمتر اتفاق میفته که کسی‌ برای بار اول نان کاملا بی‌ ناقص در آره. اما اگر با روش های مختلف و به کرات امتحان کردد ید‌ و باز دچار مشکل هستید شاید فر مناسب اینکار ندارید. البته این فقط یک حدسه چون از راه دور و ندیده، یه مقدار سخته که بتونم دقیق بدونم جریان چیه. به هر حال اون توضیحات اضافه رو توصیه می‌کنم مطالعه بفرمایید. امیدوارم موفق شوید.